When you need a lawyer, you should demand experience, dedication and superior advocacy from your legal representative. 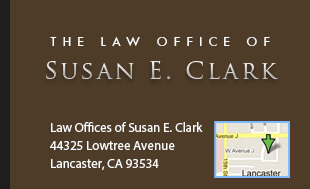 We at the Law Offices of Susan E. Clark strive to offer the best legal experience for our clients. We understand that having to engage the services of an attorney is often a once in a lifetime traumatic event for our clients. We also realize that our clients expect expedient resolution and a successful outcome to their legal matter. It is our goal to meet the expectations of our client. The Law Offices of Susan E. Clark is experienced in numerous practice areas. Whether you have a civil litigation matter, family law situation, real estate problem or probate matter, we will provide competent representation. If you need assistance with a conservatorship or guardianship, don't hesitate to call. If it is time for you to consider estate planning, we can help. Whether it is a simple will or comprehensive estate plan, including a living trust, pour-over will and durable powers of attorney, we appreciate your confidence in allowing us to perform these services. If you find yourself having to fight for your inheritance rights, you have to come to the right place for representation in matters involving probate and trust litigation. We also represent businesses for all their needs. For a professional and confidential consultation, please call 661-726-2626. We at the Law Offices of Susan E. Clark look forward to working with you and assisting you in your legal needs. To learn more detailed information about our areas of expertise, please continue browsing our website.